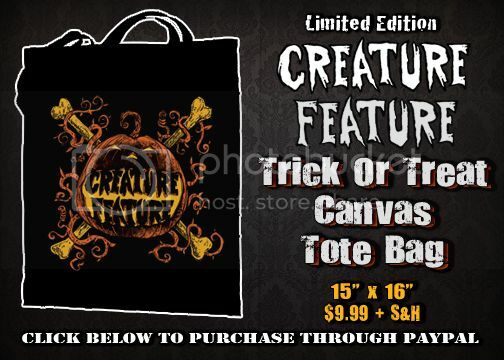 The New Creature Feature Trick Or Treat Tote Bag! We’re pleased to announce our brand new ‘Creature Feature Trick Or Treat’ tote bag to carry all your plundered treats on All Hallows Eve and any items you need to conceal from wandering eyes; knives, nooses, body parts, etc. UPDATE: These Are Now SOLD OUT!